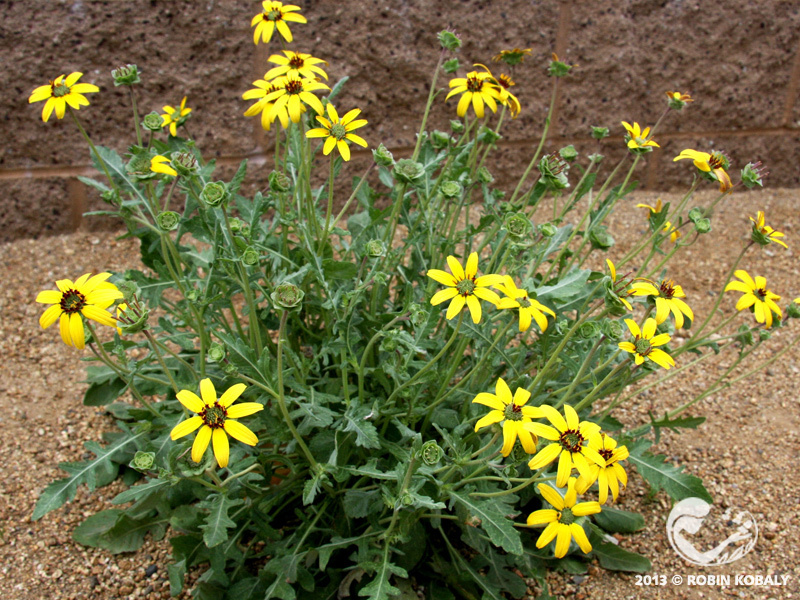 Angelita Daisy is a star-performing, long-blooming, drought-tolerant addition to western gardens. Angelita Daisy is a cheery, compact perennial at home either in tight spaces, or used to create impact as a groundcover when planted in masses on 1-foot centers. Slender, dark-green leaves compliment the profuse, golden yellow flowers that grow on leafless stems above the foliage. Remove spent flowers every few months to keep plants looking fresh over their long bloom period. 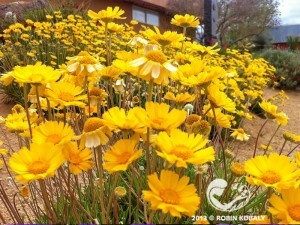 At higher elevations, flowers are concentrated in summer months, but at low elevations, Angelita Daisy blooms all year. 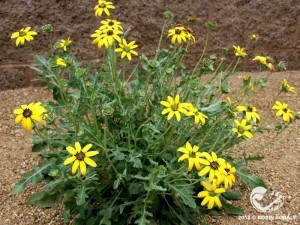 Thrives in full sun and well-drained soil. Perfect in rock gardens, borders, containers, parkways, or combined with cacti and succulents. A true show-stopper when in bloom, Red Bird of Paradise stands up to heat while attracting orioles, hummingbirds, and butterflies. 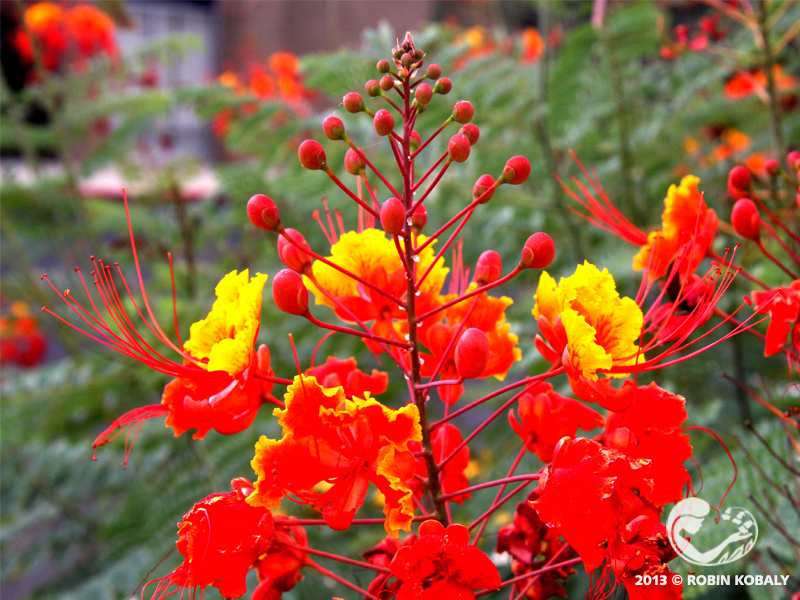 Red Bird of Paradise is a show-stopper when in full bloom from early summer to fall. Brilliant orange-red and yellow ruffled flowers contrast strikingly with the deep green, fern-like foliage of this subtropical beauty. 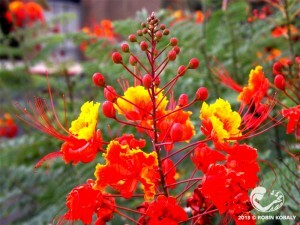 Prized for its incredible heat tolerance, and its spectacular bloom in both desert and tropical plant palettes. While it accepts almost any soil, full sun is a must for this luxurious-looking plant. Tolerates drought, but flowers best if given deep watering every two weeks in summer. Because its foliage and stems freeze at about 28 degrees, stems should be cut back nearly to ground level after winter dormancy, just before its surge of new spring growth (you’d never guess it froze back with its fast growth in spring). Attracts orioles, hummingbirds, butterflies…and people! This aromatic, clumping perennial smells and tastes like garlic — even its edible flowers! Society Garlic is a fast-growing, clumping perennial with many narrow, blue-green leaves from a central point. 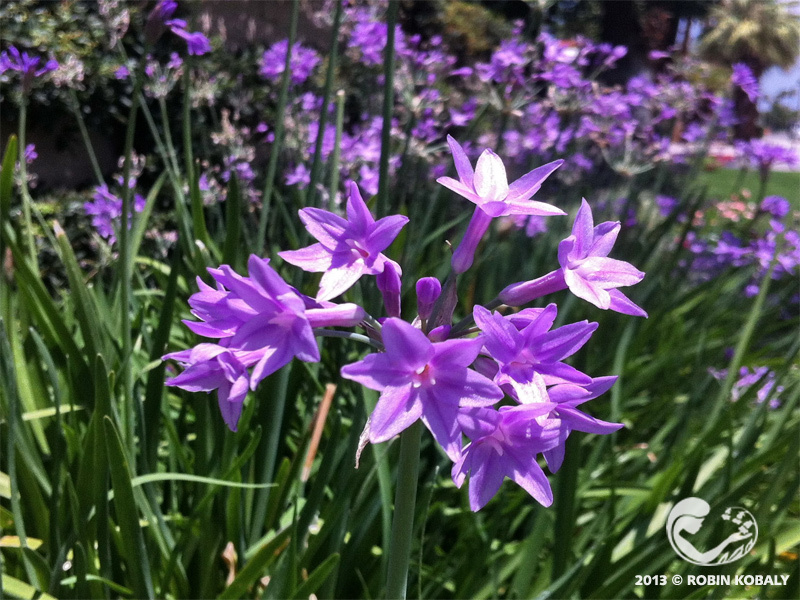 Clusters of star-shaped, rosy lavender flowers rise above clumps on 1-2 foot long stems, with peak flowering in spring and summer. May be frost damaged at 20° F, but quickly recovers. The whole plant has a garlic odor, making it bad for bouquets but good for seasoning. Besides its value as a decorative, heat-loving ornamental, the leaves can be used like garlic chives and its bulbs like garlic. Its name is said to come from a notion that you don’t get bad breath from eating it. Its sweet-scented, edible flowers are beautiful in salads. 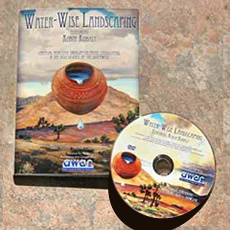 Survives extended droughts, and needs well-drained soil. Tolerates shade, but with little flowering. 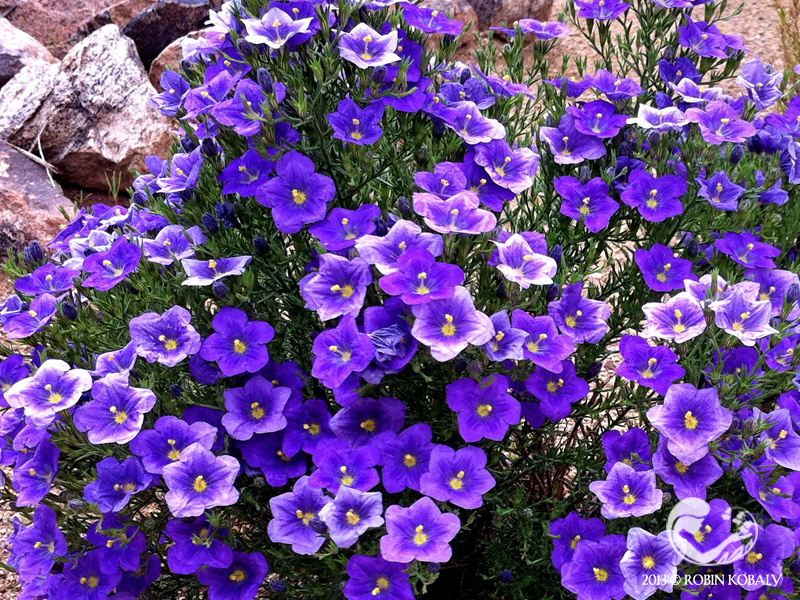 Ideal plant to dress up an herb garden or rock garden, as well as along borders or in containers. This cherry, aromatic perennial releases a new batch of cocoa scent each morning. Chocolate Flower smells good enough to eat, but it’s also a cheery, flowering perennial with sprays of yellow, daisy-like flowers (with colorful maroon stripes under each petal) from late spring to fall. This mounding herb blooms at night and early morning, making a new supply of cocoa scent overnight before the petals droop by afternoon. Can be used in a wildflower meadow or as an accent, and likes full sun, but tolerates filtered sun and any soil type with good drainage. Collect seed in summer to propagate more plants, and cut back in winter for fuller plants next spring. The rich scent of the flowers carries quite a distance downwind, and the fragrance of cut bouquets as a nosegay can be appreciated all day. Install near patios or breakfast nook for early morning delight. A must for any chocoholic gardener. 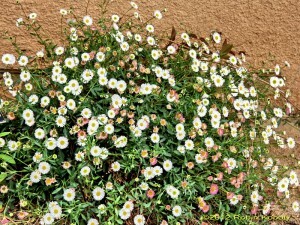 This cheerful mounded daisy shows flowers from pink to white as they age. 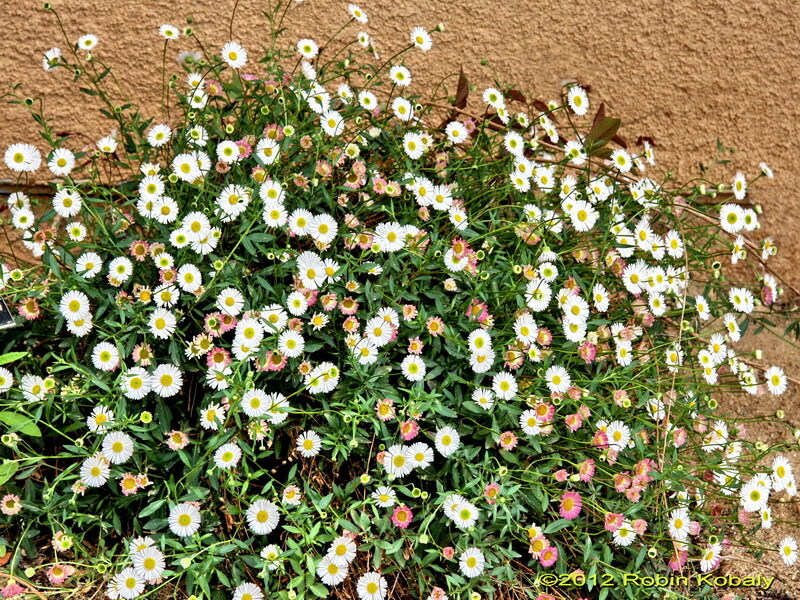 Santa Barbara Daisy is a graceful, trailing groundcover especially beautiful when cascading over walls or pots. Dainty white flower heads turn to pink, then to mauve as they age, resulting in several colors at once on this spreading plant. Summer heat can shut down flowering, but cool fall weather stimulates flowers again until frost. Cut to ground in winter to renew plant. Prefers full sun, but can tolerate partial shade, and is very drought tolerant. 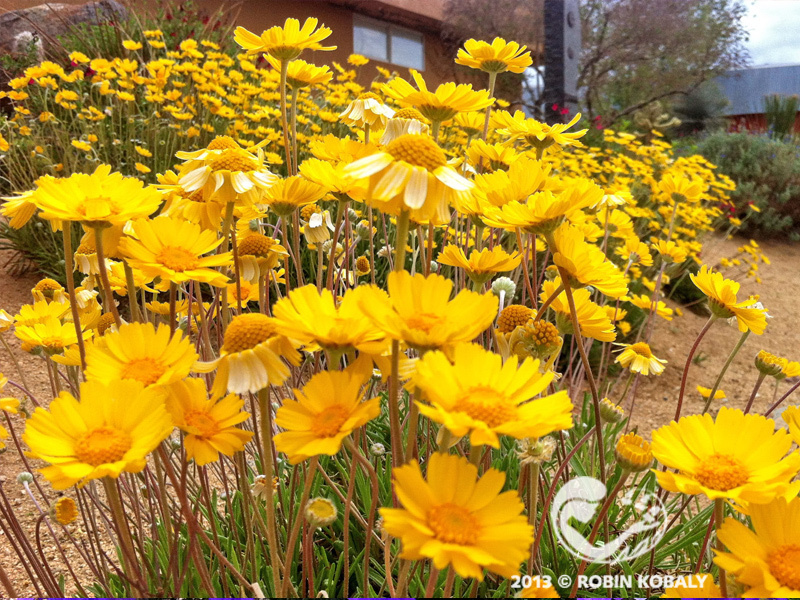 Santa Barbara Daisy can be a bit invasive with moderate water. Great addition to a butterfly garden. Use this versatile perennial as a groundcover, in containers and rock gardens, hanging baskets, window boxes, and even tucked into the crevices of rock walls. Purple Robe forms a much-branched, spreading mound with inch-long, purple, bell-shaped flowers that literally cover the whole plant all summer. Even in heat, Purple Robe flowers hold their deep, rich color. The foliage on this long-blooming, easy-care perennial has a fern-like appearance. Trim the whole plant back after flowering to lengthen life. Plant in fall or winter for flowers in summer. Mulch in summer to retain moisture and help keep soils cool. Purple Robe is an excellent plant for rock gardens, as well as for borders, bedding, baskets, window boxes or containers. While this tender perennial normally survives our mild winters, it can be grown as an annual in areas with freezing winters.